So here is my sister’s menu, captured only by iPhone, alas, but I wasn’t about to be that guest who lets food get cold and wine get warm. No sir. I snapped a few photos with my phone and we immediately tucked into dinner on that warm Saturday evening. Here’s a modern Mediterranean-inspired menu that features fresh ingredients and simple preparation. It’s great for 4 or more people and much of it can be prepared in advance. Grilled Vegetable Kabobs – You don’t need a recipe for these – just try to eat the rainbow. Purple onion, red tomatoes, orange bell pepper, green or yellow zucchini, white mushrooms, etc. Soak bamboo skewers over night in water and thred the vegetables on for grilling. This is a fun job for kids! If you really want a recipe, this one from Chungah of Damn Delicious is about the prettiest I have ever seen. So there you have it! Plenty of inspiration for your next gathering around the grill. 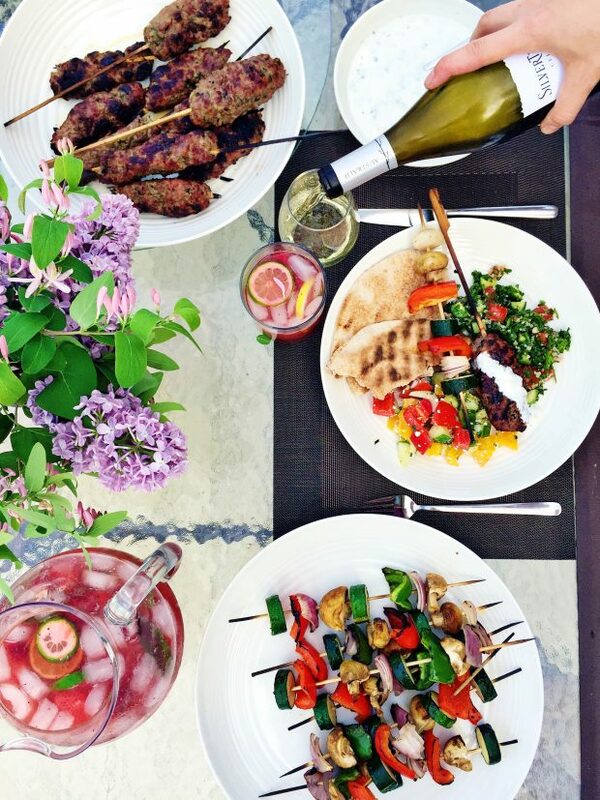 Find more ideas like this on my Pinterest board Simple Summer Entertaining. Oh my goodness, talk about a perfect spread! I don’t even know where to begin everything looks so amazing. That’s about how I felt, Mary! 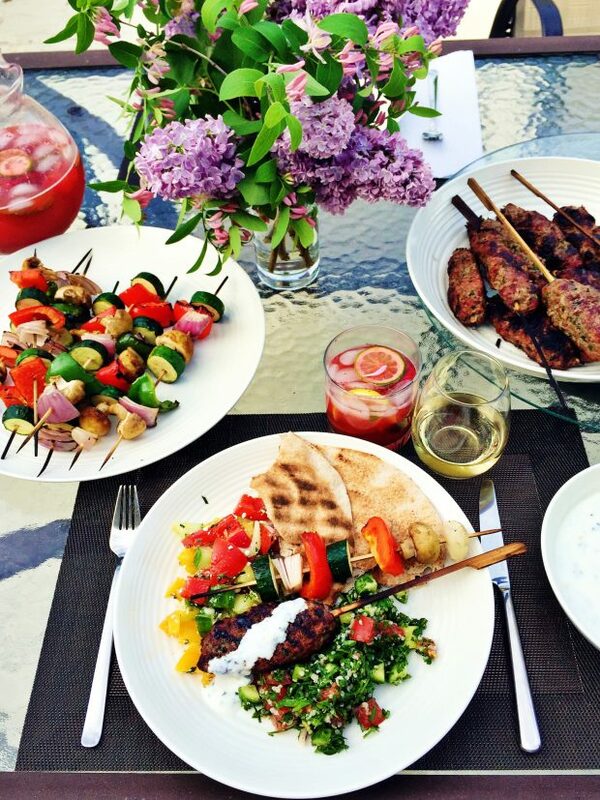 After winter food, it’s such a treat to dig into grilled meats and crisp salads. I love when you post full menus like this! How veggie-centric and yummy everything looks. Love it. Thanks, McKenzie, and after a long winter, I think most meals should be veggie-focused! Gorgeous! Tiny typo: glowing coals are mesmerizing (not memorizing). I really enjoy your blog — well done! What perfect timing. I’m compiling ideas to take on an RV road trip and this is a perfect menu to include! I wonder if the beef Kofta kabobs could be made with lamb or a combination? Seems like the flavor would be even better, if you like lamb, like I do. I think I will try making and freezing and then pulling them out to thaw on the grill when camping. I love lamb, and agree that the kofta would be fantastic with lamb. Let me know how they work out for camping! hey girl it all looks so yummy! Thanks, Shawnna. Nice of you to pop in!